Abdul Hayee, alias Sahir Ludhianvi, was born on March 8, 1921, in Ludhiana. He began writing poems when he was doing intermediate from Government College, Ludhiana. He was barely 19 when a satirical verse on Emperor Shahjahan — Ek Shahensha Ne Daulat ka Sahara Lekar Hum Garibon Ki Mohabbat ka Udaya Hai Mazaq — that he recited at a college function created a pandemonium in the literary circle. Sahir arrived in Bombay in 1949. His tryst with lyric-writing began with Thandi hawayen lehra ke aayen... for Mahesh Kaul’s Naujawan. Fame came to him with Tadbeer se bigdi huyee taqdeer bana le... for Baazi. This was followed by the chartbuster Yeh raat yeh chandni phir kahan for Jaal. Sahir took film lyrics to the heights of genuine poetry. The songs of Dharamputra rewrote history as the genius of B.R. Chopra and the enthusiasm of Sahir coalesced to yield timeless numbers like Main jab bhee akeli hoti hoon, Bhool sakta hai bhala kaun yeh pyari aankhein, Mere dilbar mujhse khaffa na ho. The popularity of songs of Naujawan, Baazi, Jaal and Dharamputra fine-tuned Sahir’s working relationship with Dev Anand, S.D. Burman, Guru Dutt and B.R. Chopra to form formidable combinations that dominated the film scene for several decades. 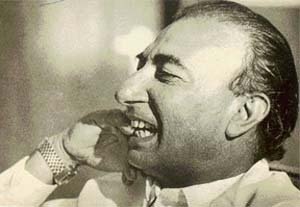 Sahir’s mastery over the Urdu language, immaculate diction, intensity of feelings and emotions and enchanting style of expression made him a lyricist of a different kind — a class apart. 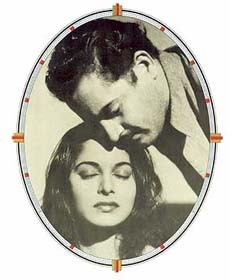 In Guru Dutt’s Pyasa, his songs Yeh duniya agar mil bhee jaye to kya hai, Jinhen naaz hai Hind par woh kahan hain, Jane woh kaise log thhey jinke pyar ko pyar mila won him acclaim. Sahir’s mother Sardar Begum was the fourth wife of his father Fazal Mohammed, who ill-treated her. Sahir was hardly eight years old when his mother left her husband and took Sahir with her. He grew up to hate exploitation of women. He wrote Kapdey hee nahin roti ke liye yahan khal bhee nochi jati hai/ Beti ho, behan ho ya maan ho her lash dabochi jati hai. He made his songs vehicles for dissemination of his social commitments and iconoclastic ideas. In Yash Chopra’s Daag, he came down heavily on the feudalistic and chauvinistic attitudes of society in the song Jab bhee jee chahe nayee duniya basa lete hain log/ Ek chehre pe kayee chehrey laga lete hain log. In Zara Hind ke rehbron ko bulao yeh koochey ye galiyaan yeh manzar dikhao, he highlighted the condition of the downtrodden. In Rehne ko ghar nahin hai sara jahan hamara, he expressioned his disillusionment with Nehru’s socialism. To those who fanned the fires of hatred and communalism during Partition, he counselled sanity, saying Malik ne to insaan ko insaan banaya/ Hum ne use Hindu ya musalmaan banaya. Even his light-hearted numbers like Insaan ka nahin kahin naam-o-nishan.. Yeh hai Bombay meri jaan, were satirical. Be it a patriotic number like Yeh desh hai veer jawano ka... or a bhajan like Alla tero naam Eshwar tero naam or a captivating qawwali like Na to karvaan ki talash hai na to hamsafar ki talash hai or a lullaby like Tere bachpan ko jawani ki dua deti hoon aur dua de ke parishaan si ho jati hoon — his songs were always suffused with a rare passion. S.D. Burman, Khayyam, Madan Mohan, Roshan, Ravi, N. Dutta, Jaidev, etc were some of the leading composers with whom Sahir worked. Seldom has the confluence of words and music been so divinely inspired as in Yeh zulf agar khul ke bikhar jay to achha, Chhoo lene do nazuk hoton ko, Kabhi khud pe kabhi halat pe rona aaya, Main zindagi ka saath nibhata chala gaya, Kis ka rasta dekhe ay dil ay saudayee, Dukhee man mere sun mera kehna, Jayen to jayen kahan, Tum na jane kis jahan mein kho gaye, Hum intezaar karenge tera qayamat tak, etc. Over five decades have passed, but his songs remain as fresh as ever. All his songs bear the stamp of his individuality. Sahir was an emotional and sensitive poet. He wrote from the heart. When Sahir caught a glimpse of his beloved Sudha Malhotra — who was newly married at the time — at a party, the immortal lines Chalo ek bar phir se ajnabi ban jayen hum dono flashed across his mind. When for Yash Chopra’s magnum opus Kabhi Kabhie, Sahir wrote Kal aur aayengey naghmon ki khilti kaliyaan chunnewale/ Mujh se behtar kehnewale tum se behtar sunnewale.. Main pal do pal ka shayar hoon.. he did not foresee that his lyrics would win for him a place in the immortals of Indian cinema. Sahir was hardly 58 and at his creative best when he suffered a massive heart attack. This bard from Ludhiana bid adieu to this world on October 25, 1980.